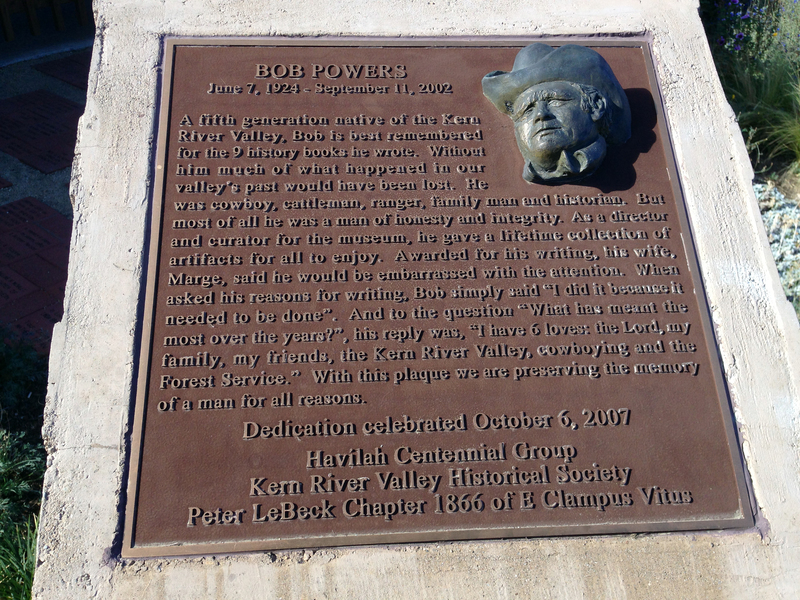 Bob Powers was born in Old Kernville, and is the fifth generation in his family to have lived in the Kern River Valley. He retained his love of the outdoors, the high country and the cowboy lifestyle. He was devoted to sharing the valley's history with his children, grandchildren and all of us. Powers, who passed away Sept 11, 2002, was the author of nine books which comprise the comprehensive history of the Kern River Valley. These books are used as a curriculum resource for local students and serve to educate newcomers about early Kern Valley history and the pioneer families that settled here. Bob was also the recipient of numerous awards throughout the country for his writing. He was a member of the Kern River Valley Historical Society and curator of the museum. Many of the displays throughout the museum were given to the society from his lifetime collection of memorabilia from our valley. A gentle man, he touched the hearts of all those who knew him and was loved throughout the Kern Valley. A monument plaque was dedicated to Powers at the Kern Valley Museum in October, 2007. The monument is located in the front of the Museum grounds. Recently, the board of U.S. 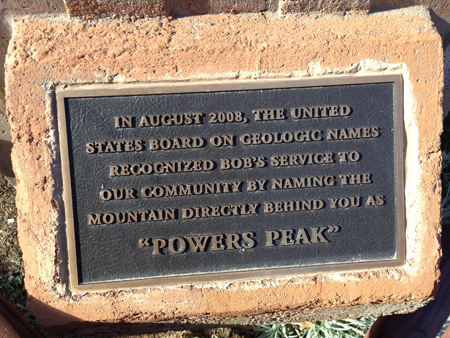 Geographic names has officially named a mountain peak in Kernville, Powers Peak. Over the next four years the name will be showing up on maps as they are revised. This is an exceptional honor for Bob Powers, his family and many friends. His unique legacy warrants such recognition. The dedication ceremony took place on November 8, 2008, 1PM, at the Fish Hatchery in Kernville. Click the image below to view a large version of the image so you can read the dedication. Bob's series of books may be purchased in the Museum's gift Shop.